HowToRepairGuide.com: Top will not go down on 1999 Mercedes 500SL? This problem is faced by many other users too. The top will not go down, when you press the switch all you hear is a click in the passenger side behind the door. The roll bar won't go down either, same clicking noise. You cannot put the roll bar down manually. You can try pressing the top of the roll bar switch for 10 seconds and then try lowering the roll bar again. This will sometimes relatch the roll bar and make it functional. 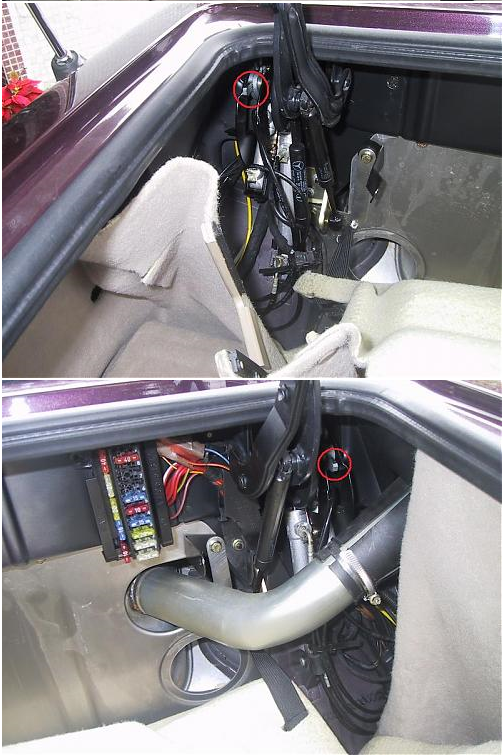 Then you will need to remove the trunk lining at the rear in order to access the lever to release the rear latches. The later models like yours did not all have the little arm that you can rotate with the wrench. You might need to get in there and manually trip the latch with a screwdriver. The left and right rear latches. The release lever is circled.